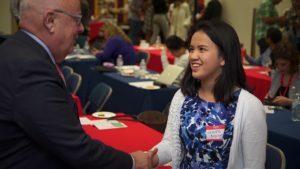 Valerie Nguyen is a first-year Carolina and Innovation Scholar at the University of North Carolina at Chapel Hill studying Biology. She graduated from Centreville High School in June 2018 where she founded Wildcats vs. Cancer club to help others battling cancer. This club began in October 2015 and during her time there she raised over $35,000 for the childhood cancer community. 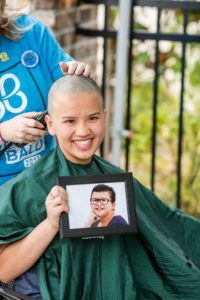 She has shaved her head, spoken on Capitol Hill to congressmen and women, and given a TEDx talk on the topic of childhood cancer. Today at UNC, she works in a research laboratory studying epigenetics in Ewing’s sarcoma, volunteers weekly at a pediatric oncology clinic and is working in Dr. Rosandra Kaplan’s lab this summer to further immerse herself in the childhood cancer field. 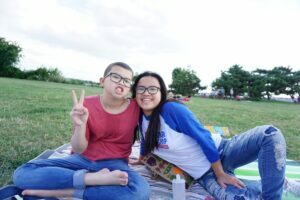 Cecilia Nguyen, Valerie’s sister, passed away in October 2016 at the age of 13, after a fierce battle with osteosarcoma, a form of childhood cancer. Valerie continues to honor her sister through her work every day. Childhood cancer can happen to anyone and impacts the entire family. Valerie continues to raise awareness for childhood cancer and promote awareness for siblings of cancer patients –“oftentimes it is the siblings who live in their siblings’ shadows”. Valerie continues to serve as an advocate for childhood cancer. CCF is proud to work with Valerie in bringing attention to the siblings of childhood cancer. Join Valerie at the 2019 CCF Research Symposium, where Dr. Kaplan will be the keynote, on June 5, 2019.